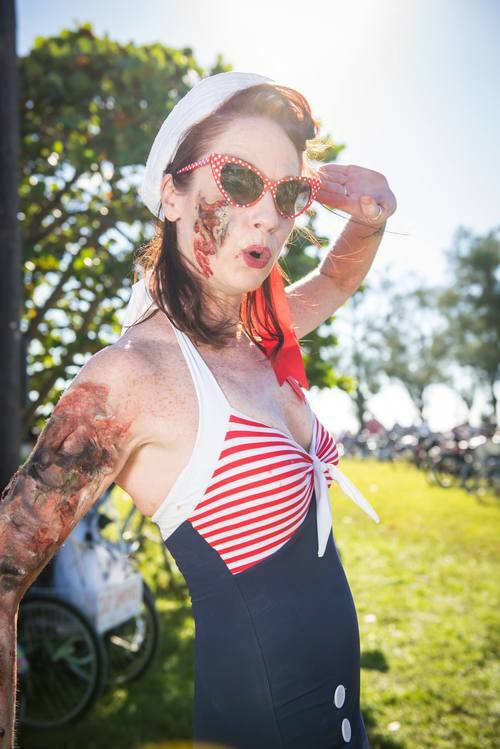 WeCycle Bike Shop and Wonderdog Productions invite you to become a sponsor of the 9th Annual Zombie Bike Parade in Key West on October 21, 2018. This zany, family friendly event is one of the most unique and colorful on the island, and is anticipated to attract 7,500 participants and garner national media attention. The event begins at the historic – and haunted – Fort East Martello before making its way down South Roosevelt Blvd to a block party on Duval Street. Logo on the front of 1,000 limited edition 2017 Zombie Bike Ride T-shirts. Logo and weblink ad on zombiebikeride.com. Social media shout out. Logo on 10,000 Zombie Bike Ride fliers. Logo on 250 Zombie Bike Ride posters. What began as a mere 70 bike-loving enthusiasts in 2009 has grown to be one of the largest and most memorable events in Key West for locals and visitors alike. Show your support with a sponsorship today! Include your logo (JPG, EPS, TIFF or PNG). To be included on the T-shirt and print material, please send logo files by 5pm on September 25, 2017.